Folkstar has been in the Karmic Fury Records studio for several months recording the follow-up to their debut album Emotional Bootcamp. The new album is aptly titled Loud and Clear because it is a very daring and bold record. Folkstar takes both musical and lyrical risks with this new material, speaking their minds and tackling tough subject matter like life and death, suicide and dreams, the flaws of our society and the beauty of our world. The title track tells the story of Sue’s hearing loss. It also talks about a “wake up call” which is a common theme throughout the album. 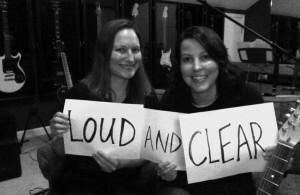 Loud and Clear has more of a rock feel to it than Folkstar’s last album and is an ambitious 16-tracks in length. To learn more about the album and all things Folkstar please visit http://folkstar.net. There’s a fantastic blog describing the album and the meaning and inspiration behind it here: http://folkstar.net/loud-and-clear-folkstars-new-album. Folkstar begins the mixing phase this Friday with acclaimed engineer Karen Kane. Album street date to be announced very soon.